... she's going to love these bracelets! Made several of these the other day because I love how they look all staked - serious ARM SWAG going on!! Ready for the tutorials? ... keep reading, it's all there! I made these on a very rainy day - felt too lazy to go out and look for the right size colored ropes - beside, this way you don't have to add anything to your existing stash! I let the ropes sit into the paint for a bit, then squeeze the excess color out. Let dry almost completely and then used a sponge with just the fabric color on. Let dry very well - and use your iron on high temperature to fix the color. Cut the rope to fit the wrist and glue the ends into the clasp! So what you say? Aren't these gorgeous? Another very very nice tutorial! Really amazing tutorials from the dyeing of the rope to the raffia and stud placement. LOVE THESE BRACELETS and who wouldn't want any of the three stacked on their arm? Posted on truebluemeandyou with a link back to you. Thank you so much for linking it to your "kind of a big deal tumblr blog" :D !! d.
Thank you Divya! I love it too! Raffia this year is everywhere! 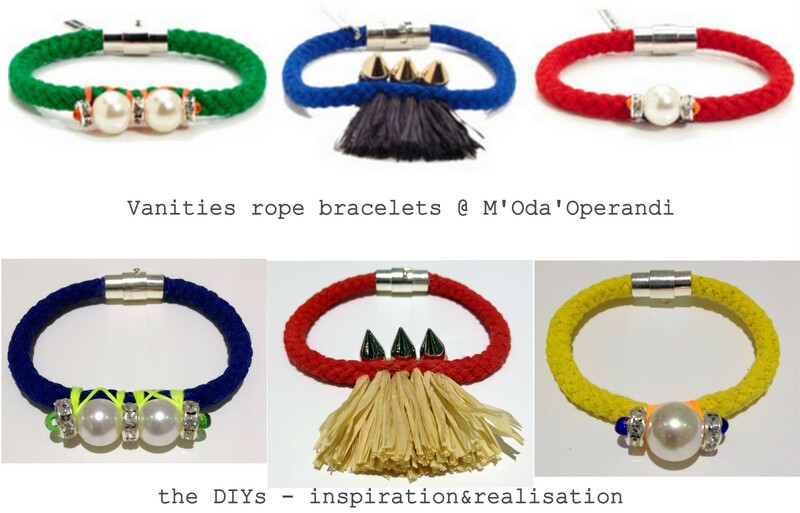 I love the 3 bracelets, but the raffia bracelet is the most amazing diy I have ever seen! These are all so incredible Donatella! I especially love how you dyed the rope, it's GENIUS! che belli! Veramente ingegnoso questo tutorial!